Is the fourth son of the late Walter Boyd, Esq., of Dublin. He took his B.A. degree in 1855 at Trinity College, and in 1864 the degree of LL.D. was conferred upon him. He was called to the Bar at the King’s Inn, Dublin, in 1856, obtained his silk in 1877, and was Queen’s Advocate for Ireland from 1878 to 1885, in which latter year he was elevated to the Irish Bench as Judge of the Court of Bankruptcy. In 1897 he became a Justice of the High Court of Justice in Ireland, Queen’s Bench Division. Judge Boyd has been a boat or yacht owner since a very early age. Like many members of the legal profession in Ireland, he has taken advantage of the prox­imity of Kingstown to enjoy a complete change from the Four Courts, and is one of the most noted yacht-owners in Dublin. Aideen, Yawl, 34 tons. Mr. Otto M. Schiff. 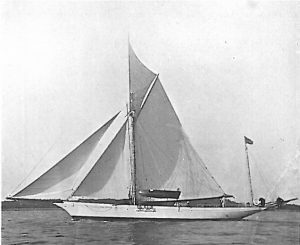 In 1882 Stow and Son built for him the Hofda, a 16-ton cruiser, which he also used for racing, and with which he secured several flags. This was followed by the Aideen, 34 tons, and she too was used for racing and cruising purposes, and was the winner of many races. In 1892 he purchased Thalia from Mr. Inglis. She was a Fife boat, and the most successful 40-tonner of the 1891 season, racing in a very hot class. Judge Boyd raced her for several seasons, and she has won for him a very large number of races, chiefly in connection with the Kingstown Clubs. In recent years he has not raced her, but has kept her for cruising purposes only. He is a keen yachtsman, and has displayed the greatest interest in yachting in Ireland. He is Rear-Commodore of the Royal Alfred Yacht Club, in which post he succeeded Mr. John Jameson in 1892. He also owns the Aura, 3 tons, a most successful little vessel. Clubs: Royal Alfred, Royal Irish, Royal St. George, Howth Sailing.